Author Note: I’m taking a hiatus from writing because finals are coming and I’m feeling particularly indolent at the moment, so in order not to bore you out with me not posting anything, I present to you something I wrote since February. The main couple would be SouRin, Yamazaki Sousuke and Matsuoka Rin, like the title said. Also, a few hints of MakoHaru (Tachibana Makoto and Nanase Haruka, that is) if you squint really hard. If you have anything against said couples, I advise you to stay as far away from the fic as possible. Thank you. Summary: Crossover with the RPG Game “Ib”. Rin and Sousuke got stuck in (deceased) artist Nanase’s art exhibition, soon to find some things were out of the ordinary. A friendly reminder that in this story Haruka and Makoto were long dead before the Samezuka boys were even born. And “Ai” here is by no means Nitori Aiichirou (the two boy’s underclassman in high school), it’s my female OC specially saved for this fic :)) She looks a bit like Nagisa though, but with longer hair and more vibrant ruby eyes. The words in italics are translyrics to [Ib] -again- which can be found here. I haven’t asked for permission to use it yet, so please don’t take it elsewhere. Thanks. I recommend that you hear the 96Neko version for this song, it’s way cooler and more soothing. 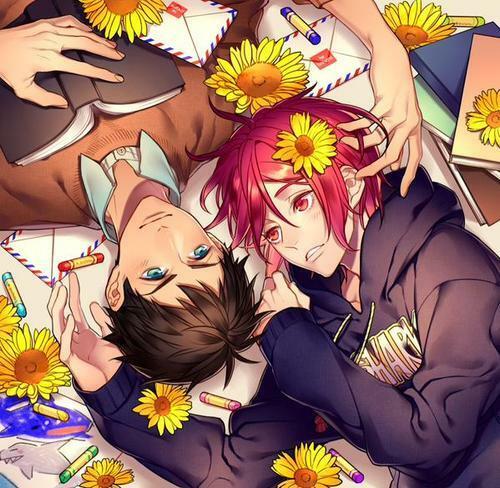 Rin wrapped himself in Sousuke’s jacket and laid down in the raven-haired boy’s arms. It was not long before he was sound asleep. Since it was the last day before Rin travelled to Sydney to pursue his dream of becoming an Olympic swimmer, his best friend Sousuke and his little sister Gou insisted on taking him on a tour to an exhibition of the renowned artist Nanase Haruka. Several hours later Gou was nowhere to be found, and the two boys had gotten well and truly lost inside this goddamned (fake) art gallery for who-knew-how-long, and no one even bothered to come help them anyway. Apparently this gallery seemed to have some sort of supernatural force driving it to the extreme. Moving sculptures, paintings popping out of their frames and chasing people, dolls and plush toys which seemed too much alive, etc. All of them added to the horrific scenery here. Sousuke watched Rin as the redhead was snoring soundly and displaced some of the stray hair behind his ear. Teal eyes carefully examined the area around him, just to notice nothing peculiar was around them. Sousuke softly sighed in relief. They had finally had some peace and quiet, after all the bedlam they’d been through. Even if it was just for a while, this brief moment was truly precious. Sousuke suddenly had vague memories of a painting. He couldn’t completely decipher what was written on the title for Kanji was still too advanced for him; he only heard adults telling the piece was called “Sincerity”. It was a portrait of a man with emerald green eyes and messy brown hair. His eyes were emotionless, but they were not dead either. They did have some sort of light, a light full with truthfulness as Sousuke looked a bit closer. And his smile. It was not as mysterious as Mona Lisa’s, in fact, it was not even hard to understand at all. That smile, as the adults said, was that of someone who was willing to help, willing to give a hand. He had heard rumors that Nanase-san had never drawn a portrait of a real person before; however, this man was too much alive. Some even said that painting was of a man close to him, however there was still much to learn about the reclusive artist, therefore the information remained merely words between mouths. Ah, he recalled of that smile. That was the exact smile Rin gave him earlier when he offered to get both of them out of this terrifying place. That was the smile he had, along with his teary eyes, to reassure Sousuke that everything was going to be fine. It was pretty ironic since it was usually Sousuke who took care of the comforting part. And to remember that the same man had chased him, got hold of his rose and tore them to pieces… Luckily enough, Rin came just in time to lure the madman away and restored his rose to full health. Come to think of it, Sousuke hadn’t done much for Rin during their trip around this gallery. It was always Rin who dragged them along while being chased by a couple of headless moving statues, it was Rin who saved him when a man in blue tried to steal his rose – his life bearer – and restored it back to full health. It was Rin who guided them through the herd of creepy moving little dolls with messy black hair and big scary red eyes. It was Rin that helped him escape the fury of [Ai], who looked pretty much like a human being but was actually another piece of art, like the other ones here. It was Rin who helped him regain his belief that they would find Gou, get out and be safe and sound. It was Rin who saved his life. Apparently Sousuke was no match for Rin in the test of courage and endurance in this particular situation. “Sou…?” Rin arched his body a bit, yawning. “I’m still here, Rin.” Sousuke said, reassuring. Awkward silence filled the ambience. Sousuke laid his head on Rin lap and closed his eyes. A moment later, he reopened them. Teal locked with bright ruby as Sousuke turned to speak. “I’ll protect you, Rin. No matter what it takes.” was Sousuke ’s last thought before allowing himself to fall into a deep, long slumber. Draw me on it, okay? The teens were a bit frightened by all the shouting and screaming coming from the little girl; however, they didn’t comply to her request. They ran as quick as they could to the portrait of the girl. Rin didn’t hesitate at all when he tossed his flaming lighter to the canvas. As soon as the silverware touched the frame, the painting burned as vigorously as it could. Ai’s frantic scream filled the air as the painting burned with all its might. Moments later, Ai’s body was nothing but sheer ashes. Her palette knife dropped with a sharp ‘clang’. “That was… terrifying, to say the least…” Sousuke panted. The two boys sighed in relief. “Rin.” Sousuke eventually turned to the other. “Huh?,” The redhead tilted his head like a little cat. Sousuke held out his right palm; and after Rin examined it carefully, he took out his sister’s handkerchief from his jacket pocket. Then he wrapped it with utmost care around the raven-haired’s wound and tied it in a knot. After travelling around like forever, the two boys encountered a dark staircase. The teens held each other’s hands and cautiously made their way down the stairs. When they finally reached the bottom, a familiar sight appeared. They made their way up to the second floor and found the big painting at the end of the hallway. Suddenly, the frame disappeared into thin air. Without hesitation, Rin took his best friend’s large hand and together they exited the crumbling world behind them. Rin opened his maroon eyes, elicited a yawn and rubbed his eyes. How long had he been sleeping like this? He needed to find Sousuke or Gou ASAP. How he had fallen asleep, he did not remember. Rin went down to the first floor to find his family and friend. He could not find Gou, but managed to find Sousuke standing in front of a sculpture of a colossal red rose. “Hey Rin.” Sousuke finally said, his eyes still looking closely at the statue. As weird as it was, Sousuke could sense Rin from approximately a kilometer away. Maybe it was due to how long they’d spent their lives together, but however the cause of this was, Rin was not quite sure. Rin looked curiously at the white piece of cloth wrapped around the raven-haired boy’s right hand. “And it has blood ON it, Sou. How did you cut your hand?” Rin asked worriedly. A spark of memory came pass those teal eyes, and Sousuke’s eyes widened. “A burnt portrait… [Ai]… broken glass…” Sousuke mumbled. “You were/I was the one who did the bandaging with Gou’s handkerchief.” they both said in unison. “So that’s why I fell asleep in the middle of a gallery,” Rin said finally. The two boys were then in hysterics.